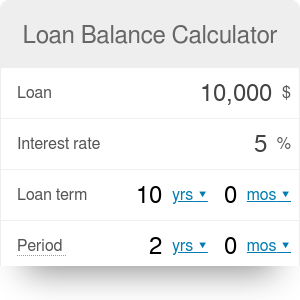 The loan balance calculator allows you to compute the remaining balance of your loan. If you want to quickly check how much you still have to repay – you have found the right tool. Our universal loan balance calculator may be used as a personal loan remaining balance calculator, a car loan balance calculator or a mortgage balance calculator. All you need to do to calculate the remaining loan balance is to fill the appropriate fields below. the time that has passed by since you took a loan. That’s all! The amount in the field loan remaining represents the value of your remaining loan. Let's try the loan balance calculator on a simple example. On 1st May 2016 you borrowed 10,000 USD to buy a new car (it was a standard car loan). The payback period was set as five years. The interest rate in the loan was set as 5% (want to know what is your monthly payment? See our interest calculator). Now, it is May 2018. The question is how much you still owe to the bank. The answer provided by our loan balance calculator is that your remaining loan balance is 6,297 USD. k - the time that passed since you have taken a loan. Do you want to be financially smart? Try our other personal finance calculators. Car purchase - Car loan is one of the most popular types of loan. Usually, the cost of buying a car is a few times higher than your salary, so you need to find additional money to buy it. Home renovation or improvement - Most of us always have something to improve in the house. You can finance these cost by taking the bank loan. Vacations/dreams - Sometimes realization of our dreams requires a lot of money (e.g., traveling, ideal wedding, unforgettable party). Medical expenses - In some cases people are forced to borrow money to cover their unexpected medical expenses. Bill consolidation - Nowadays, almost everyone has bills or debt of some sort. You can decide to consolidate your debts into just one loan. There are two reasons to do it: convenience (you have only one debt) and costs (in a consolidated loan, the interest rate is usually lower). Moreover, one of the most popular types of loan is a mortgage which is a type of loan that allows you to finance the purchase of a home. Loan Balance Calculator can be embedded on your website to enrich the content you wrote and make it easier for your visitors to understand your message.